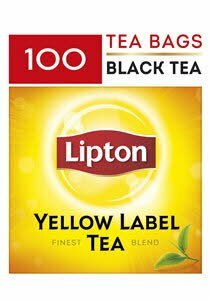 Originally created by Sir Thomas Lipton more than 100 years ago, Lipton Yellow Label is our full bodied Signature Black Tea. Lipton Yellow Label is blended from the finest tea leaves in the world that are selected by our highly experienced Lipton Tea Tasters to ensure you get that famous smooth Lipton taste. With Lipton Yellow Label, you get the fresh flavour of our Signature Tea in every cup. Lipton is working with the Rainforest Alliance to protect the environment and ensure better living and working conditions for the tea farmers. Today, more than 50% of Lipton Yellow Label tea comes from certified farms. 1. Pour freshly boiled water into your cup. 2. Put in tea bag and cover for 2-3 minutes. 3. Dunk tea bag 5 times and remove. Now your tea is ready.